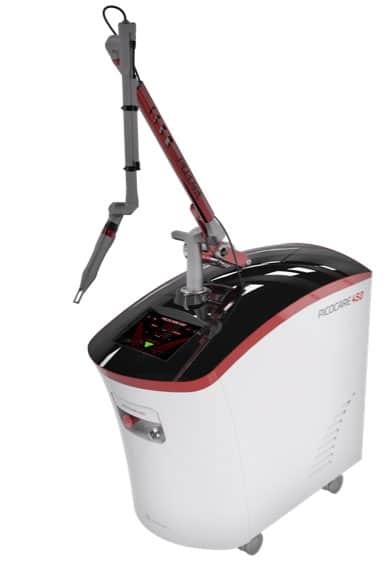 When compared with other laser tattoo removal treatments, Picocare450 Second Generation Picosecond Nd:YAG Laser tattoo removal provides outstanding results, less risk of injury to the surrounding tissue, more comfortable treatments and quicker healing time. Regular lasers use a single wavelength of light to deliver the energy to the ink pigment in the skin. But the surrounding skin can also be damaged in the process. The Picocare450 Picosecond Laser delivers light energy in very short bursts in a choice of two wavelengths, so it precisely targets the cells containing pigment, with significantly less impact on the surrounding cells. The number of treatments you need will depend on the age of the tattoo, the type and colour of the ink, and how the tattoo was originally applied. Light coloured inks such as light green and light blue are some of the most difficult to remove. Q. How does Picocare450 compare to other tattoo removal methods? A. Most tattoo removal methods are harsh, painful and potentially scarring. They include surgical excision, dermabrasion (or sanding) and chemical peels. 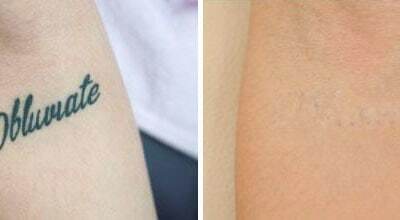 Laser treatments are safer, and more precise, targeting only the ink used in the tattoo process. The most precise of all laser treatments is Picosecond Laser, and Picocare450 is one of the most powerful pico lasers available. A. The size, location, depth and colour of your tattoo will determine how many treatments are required. Professional tattoo inks and light colours are more difficult to remove. Q. How will the treatment feel? A. Picocare450 is more comfortable than other tattoo removal laser treatments.The sensation is rather like the snap of a rubber band on the skin. A topical anaesthetic can be used if desired. Each session usually takes 10-30 minutes, depending on the size and colour composition of your tattoo. Q. What happens to my skin after treatment? A. Right after your treatment, some whitening of the skin may occur, the area around the tattoo might become reddish and could have some swelling. This is normal and will disappear gradually over time. The full effect of each treatment takes about 5-6 weeks. Immediately after treatment, antibacterial ointment and dressing will be applied to the treated area to minimise the chance of infection.